Moderate House Republicans’ hypocrisy: They support a clean continuing resolution that doesn’t exist. Are Moderate Republicans the Shutdown’s Biggest Hypocrites? Say what you like about the “Hell No” caucus—at least you know where they stand. We know where these guys stand, but where do House moderates really stand? House Republicans willing to vote for a debt limit increase without strings attached have scheduled a press conference for today at never o’clock Eastern Standard Time. The press conference where this same group will voice unanimous support for a continuing resolution to fund government is scheduled for the same time. Also the gang of Republicans willing to vote for these measures has mailed House Speaker John Boehner a letter expressing its support—if he would just schedule a vote!—that he will never receive. There are many ways for lawmakers planning to act in concert to demonstrate their desire to do something. So far, the group of GOP lawmakers willing to band together to save the country from the shutdown and budget crisis in the fastest way possible hasn’t materialized. That’s not to say that such a group couldn’t exist. There are some potential members. CNN, ABC, and CBS have been trailing lawmakers who at one time or another have expressed a desire to see a “clean” continuing resolution or other mechanism designed to keep the money flowing without asking for anything in return. The fact that news organizations must hunt these lawmakers down is the first sign that this is not a brave breed. Whatever people may say about the “Hell No” caucus that has forced Republican leaders to scramble, at least everyone is clear on who they are. The members of the Clean Caucus are not so bold. Some, such as Rep. Peter King, have been consistent and vocal. Others, such as Rep. Mike Coffman, have written op-eds calling for a clean short-term CR. So has a group of seven other representatives. But several members—such as Reps. Devin Nunes, Mike Simpson, and Leonard Lance—have already revised and extended their previous positions, which had seemed to support a clean approach. But these positions were so weak in their initial coinage that it was obvious the members would head for the cupboard if really pressed. There’s a big difference between telling a reporter in your home district that you would vote for these measures and actually voting for them. To cast such a vote would expose these House Republicans to withering heat from their colleagues, the grass roots, conservative bloggers, and high-net-worth individuals willing to fund primary opponents. They would be responsible for a stunning defeat for Boehner and a victory for the president their constituents dislike. 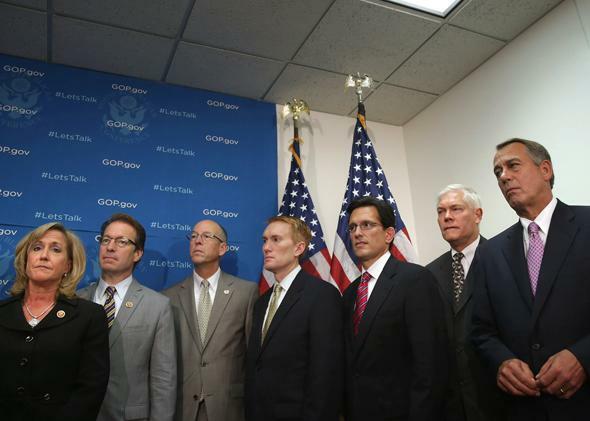 Right now, these members of the Clean Caucus have the best of all worlds. They can proclaim that they want to do the reasonable thing—which pleases their moderate voters—but never cast the vote that provokes the wrath of the party’s most active and punitive wing. This is how Boehner reads their maneuvers, and they can thank him for allowing them to have it both ways.